TEL AVIV, Israel (AP) — Twenty years after Yitzhak Rabin was gunned down by a Jewish extremist opposed to his negotiations with the Palestinians, Israel is more divided than ever over Mideast peacemaking — and the people who opposed the assassinated premier with vitriol, led by Benjamin Netanyahu, now have a firm grip on power. Initially, the assassination seemed to spark a desire for unity in a traumatized country, and Rabin’s political heirs appeared poised to continue his path. Although Rabin himself was rarely precise on the matter, most people assumed this meant a Palestinian state alongside Israel. But a massive campaign of suicide bombings by Islamic militants soon overwhelmed the political discourse. To the horror of Rabin supporters, Netanyahu was elected prime minister, by a whisker, within six months of the shooting on November 4, 1995. Repeated attempts to make peace have evaporated, leaving bouts of violence in their wake. Now, in the midst of yet another bloody round of unrest, many in Israel wonder whether peace will ever be possible. A poisonous rivalry has since emerged between Israel’s liberal and conservative camps, tracking fault lines in Israeli society. Although the divisions are complicated, they align with secular versus religious, European- versus Middle East-descended, urban versus rural, educated versus working class. The sides hold very different views on what kind of society the Jewish state should build, and especially on how to handle their entanglement with the Palestinians. Isaac Herzog, who now heads Rabin’s Labor Party, said in a recent speech the divisions are so deep that a “civil war” is a possibility. Rabin’s government negotiated the first interim peace accord with the Palestinians in 1993, winning the prime minister — along with Palestinian leader Yasser Arafat and Israeli Foreign Minister Shimon Peres — the Nobel Peace Prize. To nationalists, Rabin was a traitor willing to forsake God-given lands to Israel’s enemies. While few justify the killing, they have no regrets that peace efforts were derailed and believe the country would have been damaged had he established an independent Palestinian state just miles from Israel’s main cities. In contrast, Rabin’s heirs believe the current hard-line leadership is leading the country to destruction by not establishing a Palestinian state, since the alternative appears to be a binational state in which Arabs may one day outnumber Jews. Many say Rabin, a gruff former general and defense minister, had unique credentials to persuade the public that making territorial concessions was a risk worth taking. Supporters cynically say it ranks as one of the most successful assassinations. Killing Abraham Lincoln didn’t bring back slavery and killing Martin Luther King didn’t stop the civil rights movement. But killing Rabin may have destroyed the chance for Middle East peace. “As far as the murderer is concerned, it was a perfect, worthwhile murder,” said Zehava Galon, leader of the dovish opposition party Meretz. Rabin was shot dead after a Tel Aviv peace rally by ultra-nationalist extremist Yigal Amir. He is serving a life sentence. In the preceding months, political hard-liners, many of them fervently religious proponents of the idea that God gave the Holy Land to the Jews, branded Rabin a traitor. Some called for his death. In one famous incident, Netanyahu, then the opposition leader, addressed a protest in downtown Jerusalem where demonstrators held posters portraying Rabin in an Arab headscarf or Nazi uniform. Critics have charged that the climate of incitement inspired Amir to shoot Rabin. 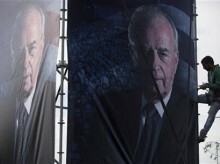 Netanyahu has said he did not see the posters at the rally. Despite decades of trauma from war and conflict with the Palestinians, it was almost unthinkable at the time in Israel that a Jew could kill a sitting prime minister and revered war hero over a political dispute. Despite overwhelming evidence, including a video of the shooting, nationalist zealots have espoused a myriad of conspiracy theories aimed at shedding the collective blame their camp has shouldered. Some Israelis say that beyond the soul-searching and tributes marking each anniversary of Rabin’s killing, key lessons have not been learned. Citing religious inspiration, extremists still threaten politicians, incite violence and carry out vigilante attacks against Arabs and dovish Jews. Eran Halperin, a professor of political psychology at the Interdisciplinary Center Herzliya, a college north of Tel Aviv, said Rabin’s legacy needs to be separated into two categories: the murder and the man himself. Schools, highways and institutes across Israel carry Rabin’s name, but the cause for which he died — pushing for peace — seems to have died with him. Prime Ministers Ehud Barak and Ehud Olmert both made offers that Israelis — as well as some mediators — saw as far-reaching. But these were either rebuffed or ignored by Palestinians and neither had quite the gravitas of Rabin. Polls show a majority of Israelis still believe in the need for a two-state solution, but on terms the Palestinians seem unwilling to accept. An even greater majority thinks it has become impossible because of what they see as Palestinian intransigence, with a growing number becoming more hostile toward them. Yohanan Plesner, president of the Israel Democracy Institute, called the assassination an assault on Israeli democracy. He said recent attacks against Arabs, soldiers and the fatal stabbing of a teenage girl at a Gay Pride parade were symptoms of disdain for freedom of expression, equality and respect for others. “If there is no democracy, there is no Israel as we know it,” he said. Yossi Sarid, a Cabinet minister in Rabin’s government, said the rise of the political right has erased Rabin’s legacy. “Those who set the tone today are the settlers and their representatives. There is nothing left of Rabin,” he told The Associated Press. Rabin nostaligists find it especially galling that Netanyahu, who has governed for more than nine years, is the country’s most dominant politician. Although he has declared his support for a two-state solution, his Likud party opposes it and little if anything has been done to further the cause. Jewish settlement of the West Bank continues.